Zelda managed to get into a whole lot of burrs. 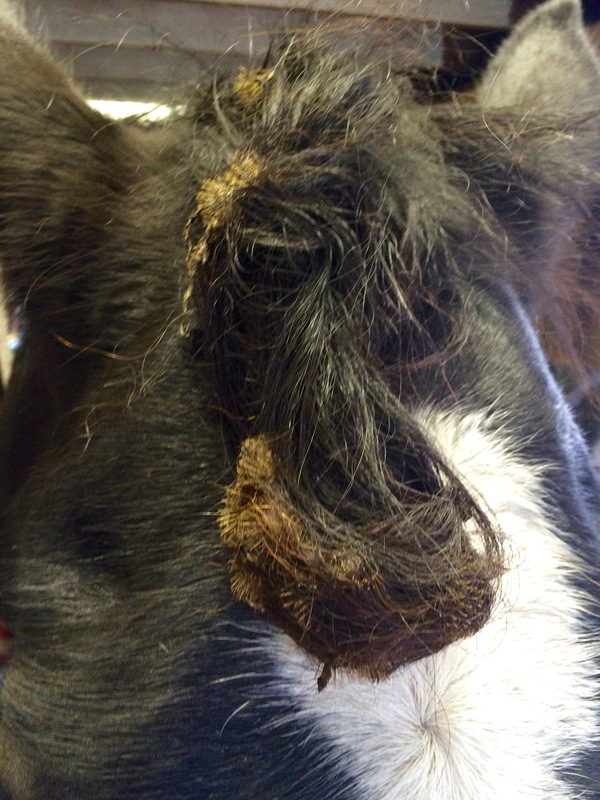 Her normally flowing forelock was a complete mess!I did eventually get them out (I thought initially I might have to cut them out), but I still don’t know where she found them. What does your horse get into? Egads what a mess! That took some patience I’m sure. Hudson gets into fences. It seems he knows the instant there’s a glitch in the hot wire. He’s been permanently banned from wearing shoes! I’m so glad you did not have to cut them out. I had a mess like that one year and cut them out. I regretted that for a long time as it grew back out. He looked like one of those kids in school whose mother had done the “home haircut”. My boy does this EVERY DAY. I keep an old pair of riding gloves in my grooming tote to tease them out. The easiest way to get them out is to gently pull hair by hair out of the matt of sticky burrs until you can just slid the burrs out. After I get them out, I always generously coat his forelock with cowboy magic and it seems to make the chore of removing the next batch somewhat easier. Picking them out everyday has been a hidden blessing, as it’s forced me to enforce my “head down, hold still” cue on a regular basis.